Dipole antenna made by wire or pipe what I cut to quarter-wavelength for each side or measure a impedance at center to 50 ohm. Actual at center of antenna (Center fed) has impedance 50 ohm balanced. I must adding a Balun to convert unbalanced signal from transceiver to balanced signal to antenna. 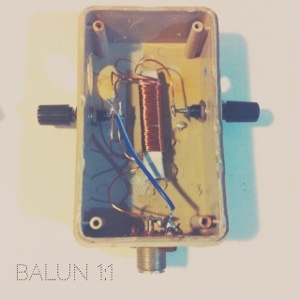 I selected a balun 1:1 for my antenna. Balun 1:1 is suppressing current unbalance signal better than a Balun choke coil. My Balun used 14 turns of 3 wire on AM ferrite rod. Next to 6 meters each side of wire for dipole antenna. Thank you @vk2zay for advice for selection a Balun.